Island Club Golf Cart Rentals offer guests of the Island Club and affiliates rentals onsite. Here, guests can enjoy the convenience of a rental option on property. Furthermore, our carts are among the best on the island. This is because we are blessed with a new fleet purchased just last year. Be sure to reserve a golf cart during your stay on Put-In-Bay. Our carts are reserved especially for guests of the Island Club and affiliate properties. This is the best way to see the island and to get to all of the legendary bars and restaurants. The absolute best way to take in all of the sights of Put-In-Bay is with Island Club Golf Cart Rentals. From a cart, guests can enjoy the wind hitting their face in route to one of the many great Things to Do in Put-In-Bay. When taking your cart around the island there are many great sights to see. For example, out past Perry’s Victory and International Peace Memorial is what is referred to East Point. Here, great parks like Massie Cliffside Preserve and Scheef Nature Preserve can be explored. Take in the exceptional views of Lake Erie and take part in great waterfront activities. The size of the island makes it a perfect place for golf carts. 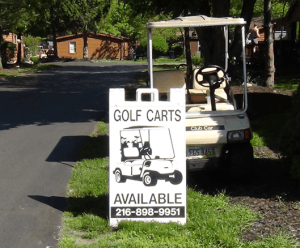 Furthermore, Island Club Golf Cart Rentals make it easy for our guests to get where they want to go. With competitive rates, new gas carts and friendly staff; the choice is clear. So, be sure to consider reserving your cart before your arrival. Then, you won’t be left out when they are completed rented island wide. We thank you for choosing us for your Put-in-Bay hospitality and transportation needs.